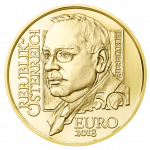 The second coin in our enlightening The Vienna Schools of Psychotherapy gold series is dedicated to Alfred Adler (1870-1937). Originally a member of Sigmund Freud’s psychoanalytic movement, Adler broke with Freud and founded the Society for Individual Psychology in 1912. Individual psychology became a viable alternative to psychoanalysis and, like the other two pioneers celebrated in the series, Adler had a major impact on the development of psychotherapy, the scientific discipline established in Vienna in the 20th century. 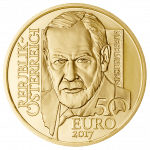 Celebrating the pioneering schools of psychotherapy – the scientific discipline established in the Austrian capital in the 20th century – the enlightening three-coin series, The Vienna Schools of Psychotherapy, gets underway in the shape of the founding father of psychoanalysis, Sigmund Freud. His theories may be the subject of much discussion, but Freud was undoubtedly one of the great thinkers of the 20th century and his work still resonates some 80 years since his death. Women may have dominated the work of Gustav Klimt, but his most famous painting also features a man. Many experts believe the man in The Kiss is Klimt himself and that the woman he is kissing is Emile Flöge, Klimt’s partner in real life. Whether or not that is the case, like the Mona Lisa in Paris, The Kiss still has the power to make people from all over the world flock to see it. 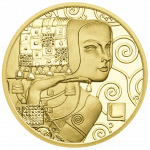 No other work of Klimt’s could provide a more fitting climax to the Austrian Mint’s Klimt and his Women series, which began in 2012 as a celebration of the 150th anniversary of the Viennese master’s birth and is now drawing to a close. Painted between 1900 and 1907 to decorate the ceiling of the assembly hall of the University of Vienna, Gustav Klimt’s Faculty Paintings were the Viennese master’s last public commission. 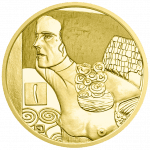 Klimt’s critics believed they broke cultural taboos and pushed the boundaries of obscenity, but their sensual beauty is plain to see on Medicine, the fourth coin in our award-winning Klimt and his Women series. Gustav Klimt did not just paint women, he revolutionised the world’s image of them. 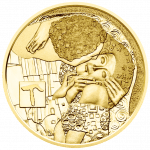 The third coin in our incomparable Klimt and his Women series, Judith II, in which the saviour of the Israelites is portrayed as a chilling femme fatale, shows this to magnificent effect. Few painters have succeeded in portraying the female form with such aplomb as Gustav Klimt. 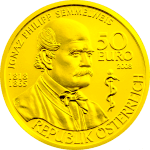 A case in point is The Expectation, which features in all its glory on the second in our stunning five-piece Klimt and his Women series of 50 euro gold coins celebrating the 150th anniversary of the Viennese master’s birth. 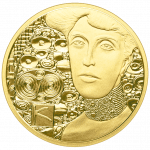 A prime example of Klimt’s “golden phase”, Portrait of Adele Bloch-Bauer I is the first of the artist’s masterpieces to feature in our superlative Klimt and his Women series. It was also the most expensive painting in the world when purchased for the Neue Galerie in New York at a price of $135 million in 2006. 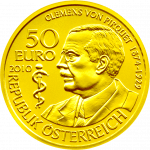 To commemorate the bicentenary of a special museum the Austrian Mint has struck a very special coin. 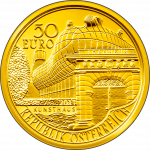 The collection of the Joanneum at Graz spans many centuries, which is reflected to magnificent effect in the exquisitely finished ancient and modern motifs on either side of this 50 euro gold coin. The obverse shows a profile portrait of Baron Clemens von Pirquet based on a contemporary photograph together with the series logo of the staff of Aesculapius. The reverse side shows a nurse with a sick child in hospital. In the background is the University Children’s Clinic. In a rounded insert we see Dr. Pirquet with his microscope engaged in medical research. The legend reads: “Begründer der Allergielehre” (Founder of the science of allergies). 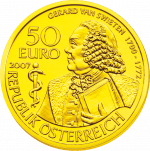 The gold coin shows a portrait of the bearded surgeon on the obverse together with the medical symbol of the Aesculapius staff. The reverse depicts Billroth and his assistants conducting a demonstration operation. The inset to the left shows the old Vienna General Hospital, where Billroth worked and taught extensively. 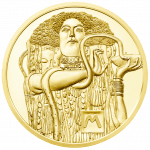 The gold coin has a portrait of the celebrated doctor himself together with the staff of Aesculapius, which is the logo for the entire series. The reverse has a bird’s eye view of the old General Hospital in Vienna, where Semmelweis was stationed in the childbirth clinic. An insert to the right shows a doctor and a student in the act of disinfecting their hands before examining a patient. 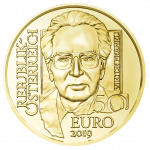 The 50 Euro coin shows a profile portrait of the great man clasping a book. It is based on a number of contemporary portraits. In the background is the staff of Aesculapius (a staff entwined about by a serpent) as the symbol of this medical series. The reverse is a composite design of the Academy of Sciences, the handwritten text of the reform “Plan pour la faculté de medicine”, and a branch of the Swietenia Mahagoni.